This report has been updated, you can read the latest numbers and statistics from the second release of the Arab Social Media Report here. Now that the situation in Egypt is slowly going back to normal (and other countries going into their own revolutions) no one, at least from the MENA region, can deny the power of social media and the effects it could have. But how much do we really know about social media use in the MENA region? Do we have a complete view of the demographics on Facebook? The conditions that affect the number of users on social media networks? Thankfully A recent report compiled and published by the Dubai School of Government’s Governance and Innovation Program sheds some light on the statistics of Facebook users in the MENA region and analyzes the use of Facebook according to data collected between April and December 2010 from the following age brackets: youths (15-29) and adults (30 and over) as well as by gender, and correlated with several factors, including digital access, gender gaps, youth population, and Internet freedom. The total number of Facebook users in the Arab world stands at 21,361,863 (Dec. 2010), up from 11,978,300 (Jan. 2010). A 78% annual growth rate. 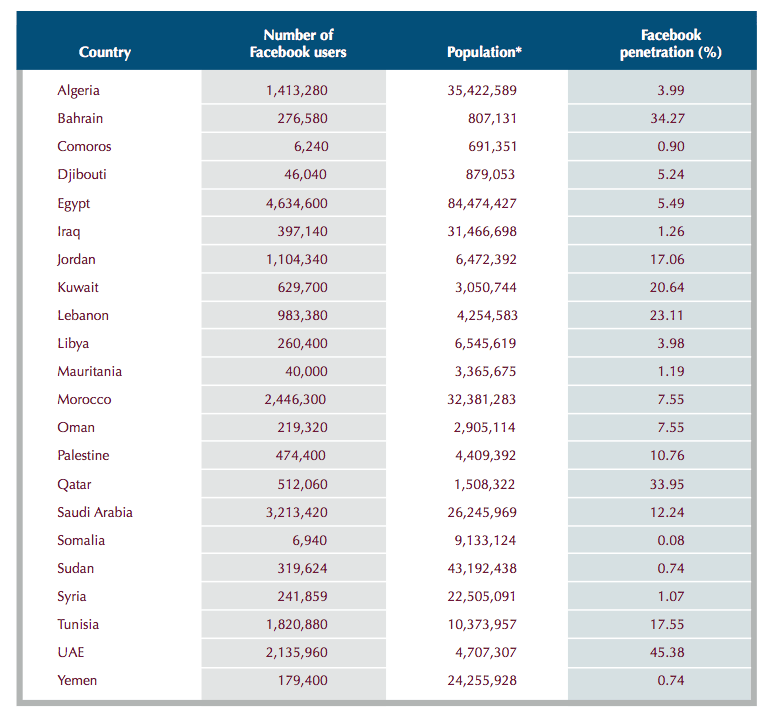 At the end of 2010, the country average for Facebook user penetration in the Arab region was 6.77%. The UAE has the highest penetration rate in the Arab region, with more than 45% of the population having Facebook accounts. 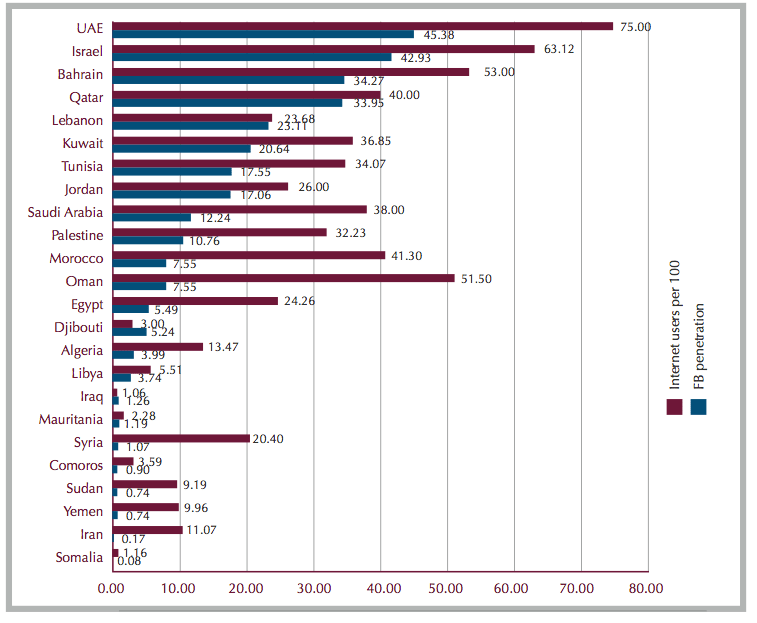 GCC countries dominate the top five Arab Facebook users as percentage of population, with Lebanon being the only exception. With around 4.7 million Facebook users, Egypt constitutes about 22% of total users in the Arab region. Youth (between the ages of 15 and 29) make up 75% of Facebook users in the Arab region. Gender breakdown of Facebook users indicates an average 2:1 ratio of male to female users in the Arab region, compared to almost 1:1 globally. The UAE has over 45% of its population on Facebook which puts it in the global top 10 ranking. But keep in mind this is in terms of percentages, the total number of users on Facebook is only just over 2 million users. UAE, Qatar and Kuwait have the most balanced age distribution. All MENA countries are male dominated by Facebook penetration due to social or the cultural restraints in the region. I’m surprised at the level of penetrations in the bigger nations and wonder if there are any reasons why they have lower numbers on Facebook. I mean there are a number of countries especially Egypt, Morocco, Algeria, Sudan that all have populations over 30 million people yet their penetration percentages are really low. It would be interesting to see how or what methods Facebook will apply to try to win these people over if possible, because it could be more of an education/literacy issue that is actually bigger than Facebook. Finally an important note in the report is that other factors such as GDP per capita and internet freedom have no effect on Facebook penetration numbers. If you have any feedback or thoughts please let us know below in the comment box. Regarding your wonder why countries with high population have small percentage of users, it is because the huge number of illiterate and extremely poor citizens. These people don't have basic life needs to be able to access internet! We have 42% illiteracy rate, and about 40% of our population below poverty line. But there are enormous projects on educating this population slot and providing them education and work. Especially after we discovered that Egypt is not a poor country at all, but all its resources was being theft! No problem glad you found it useful. The report does mention that it is the first, however they don't mention how often they will release updates. Will check and post updates on this as soon as the information is available. Do you know if they will update this soon after Egpyt events, as it would have changed things significantly? I wonder if Iraq and Djibouti are skewed by western military? How is the internet penetration measured? Perhaps US (50,000 in Iraq now) and French/US military installations (in Djibouti) might have access to the internet through satellite and aren’t counted in the internet penetration, but their users — far from home — may register their Facebook locations as Iraq and Djibouti? Hey Loufa, you have a valid point and I believe the actual population of the UAE does play a significant role in the high number of Facebook users since most of the expat's will want to connect and communicate with their friends, families back home. But for example if you take a look at the internet to Facebook penetration rates in the UAE (a lot of expats) compared to lets say Jordan (very little expats) you will find that in the UAE there is a 75% internet penetration and a 45% facebook penetration. While in Jordan its 26% internet penetration and 17% Facebook penetration. Which actually puts Jordan at a higher Facebook penetration rate according to the internet penetration. I think the existence of expats will most likely increase both facebook and internet penetration alike, but I don't think it is the main reason of the high penetration it is a factor or a variable in the entire equation. Excellent report. Just a quick question concerning the UAE, since the majority of the population is actually expatariats, don't you think that this has a direct positive effect on FB and overall internet penetration. This of course, adds to the GDP of the country when it comes to Internet usage. Thanks Imran. I hear you! Lets hope we can find numbers about Twitter usage in the MENA region soon. Amazing insight It would be great to have figures for Twitter as well.